NetApp has Hybrid Aggregate drives coming, with data moved automatically in real time between flash located next to the spinning disks. The company now says that this is a better technology than PCIe flash approaches. NetApp, presenting at an Analyst Day event in New York on 30 June, said that having networked storage move as it were into the host server environment was disadvantageous. This was according to Stifel Nicolaus analyst Aaron Rakers. Manish Goel, NetApp's product ops EVP, said SSDs used as hard disk drive replacements were not as interesting as using flash at the disk layer in a Hybrid Aggregate drive approach – and this was coming. Flash Cache in the controller is a straightforward array read I/O accelerator. PCIe flash in host servers is a complementary technology but will not decentralise the storage market and move networked storage back into the host servers. 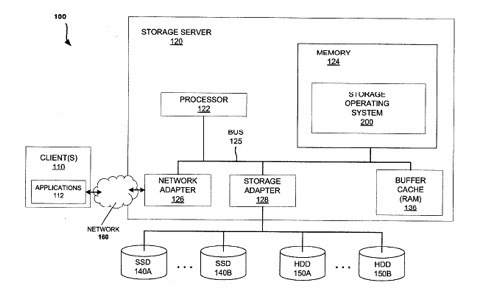 NetApp has a patent in this Hybrid Aggregate disk drive area called "Mechanisms for moving data in a Hybrid Aggregate". At least certain embodiments disclose a method, system and apparatus for relocating data between tiers of storage media in a hybrid storage aggregate encompassing multiple tiers of heterogeneous physical storage media including a file system to automatically relocate the data between tiers. The hybrid storage aggregate includes one or more volumes, each volume including a volume block number space spanning at least a first-tier of storage media and a second tier of storage media of the multiple tiers of heterogeneous physical storage media and the hybrid storage aggregate further includes a control module to cooperatively manage the tiers of the multiple tiers of heterogeneous physical storage media and a file system coupled with the control module, the file system including a policy module configured to make policy decisions based on a set of one or more policies and configured to automatically relocate data between different tiers of the multiple tiers of heterogeneous physical storage media based on the set of policies." This patent envisages an: "electronic storage medium [which] comprises a solid-state device (SSD) and the magnetic storage medium [also] comprises a hard disk device (HDD)." A Hybrid Aggregate is defined as "A logical aggregation of heterogeneous physical storage [ie, a logical container for a pool of storage combining one or more physical mass storage devices of different storage media technologies or parts thereof into a single logical storage object], which contains or provides storage for one or more other logical datasets." Surely this is what we all understand as auto-placement of data in a virtual storage pool comprising SSD and fast disk tiers, such as Compellent's block-level Data Progression? Not so, according to a person close to the situation: "It's much more automatic, real-time and granular. Compellent needs policies and is not real-time. [NetApp] will be automatic and always move data real-time, rather than retroactively." NetApp also confirmed it would release ONTAP 8.1 in the autumn. It will focus on scaling out unified storage from both a capacity perspective and a workload perspective. The company said scale-out NAS – such as Isilon as we understand it – is tuned to specific workloads, whereas scaling out its FAS block-and-file access storage is more general in applicability. Hybrid Aggregates won't be in 8.1 but will appear in a follow-on release.